Marie Gabrielle Cottage is a rustic cottage with spectacular valley and coastal views, and is set in a tranquil bush setting. The sunsets can be spectacular as you look west towards the cliffs of the Twelve Apostles. 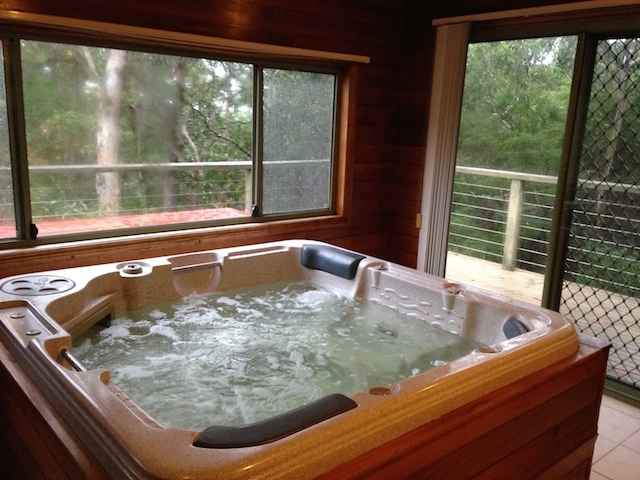 Relax and be pampered by the amazing jacuzzi, which has a captivating bush and coastal outlook. The rustic interior is sure to impress and the warmth of the fire is a natural attraction. 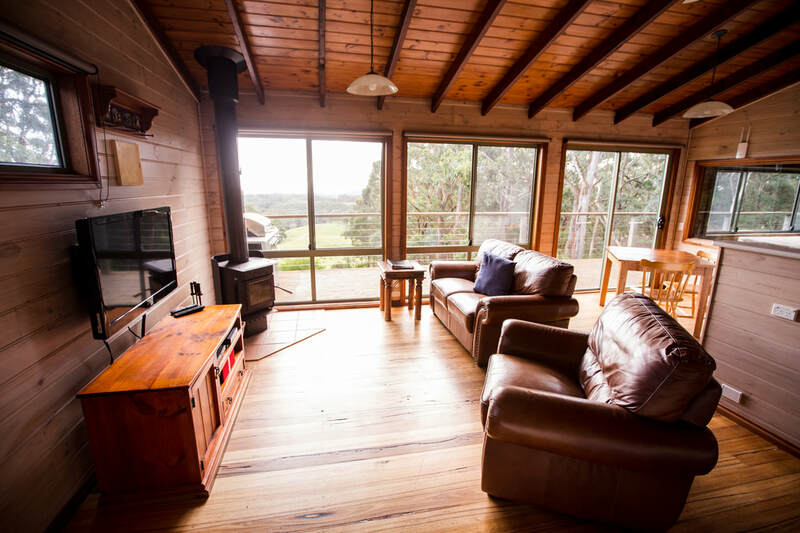 Relax and be invigorated on the spacious deck; with kangaroos, kookaburras and native parrots regular visitors. The peaceful bush scene is accompanied by the sights and sounds of nature. Marie Gabrielle is the king of the views. 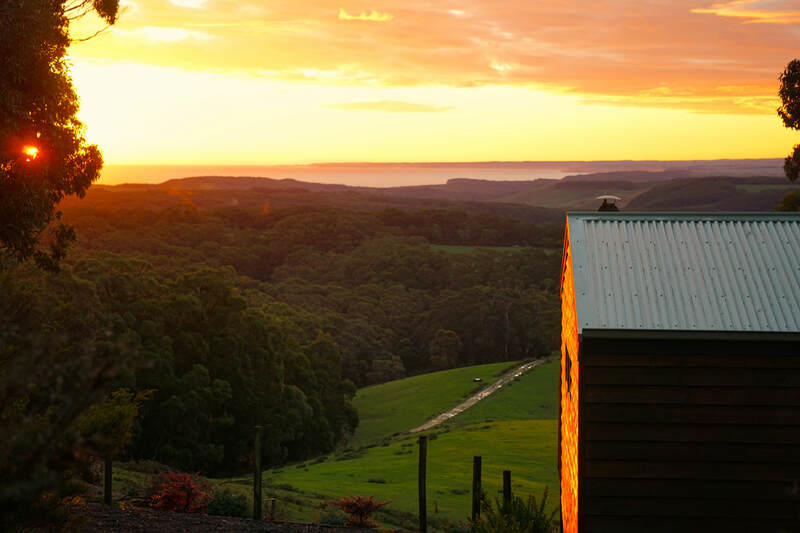 Looking down over the valleys and trees, the sun sets over the western ocean of an evening, and the sunrise shines on the sandstone cliffs of the Apostles in the distance. Marie Gabrielle is the Sunset Romance Cottage. 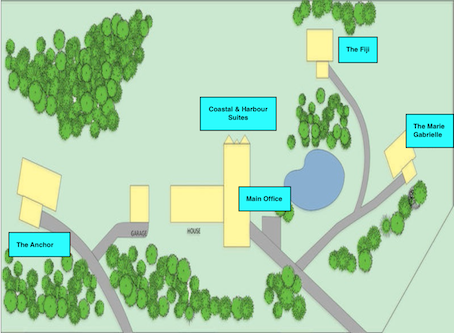 I even had a Chinese location crew want me to cancel a guest's booking so they could film the sunset and cottage! It's easy to turn off the T.V., and just stare at the majestic sunsets. The cottage that captures the beauty of sunsets! Winter Romance with jacuzzi heated to 38 degrees, the warmth and ambience of the log fire and sleeping in, while listening to the kookaburras laugh. Sizzling Summers as the aroma of the bbq mingles with the sights and sounds of nature, kangaroos grazing and gang gang cockatoos call to their partners. Sensational Springs as animals abound, echidnas wander, currawongs call and nature's playground come to life, perfect timing for bush wanderings. Wow- relax with that wine or beer, soothed by 38 degrees of warmth with just the sounds of nature to intrude- heaven! The king size bed with it's beautiful decor gives the guest a perfect night's rest. Electric blankets, underlays and comfy pillows and linen makes it easy to sleep in. The kitchen is fully equipped to give our guests all the mod cons they need for a great stay. Delightfully decorated; it's a perfect escape for that romantic getaway. All it's missing is you and that special partner! This rustic cottage is sure to impress, with it's timeless timber and warmth. 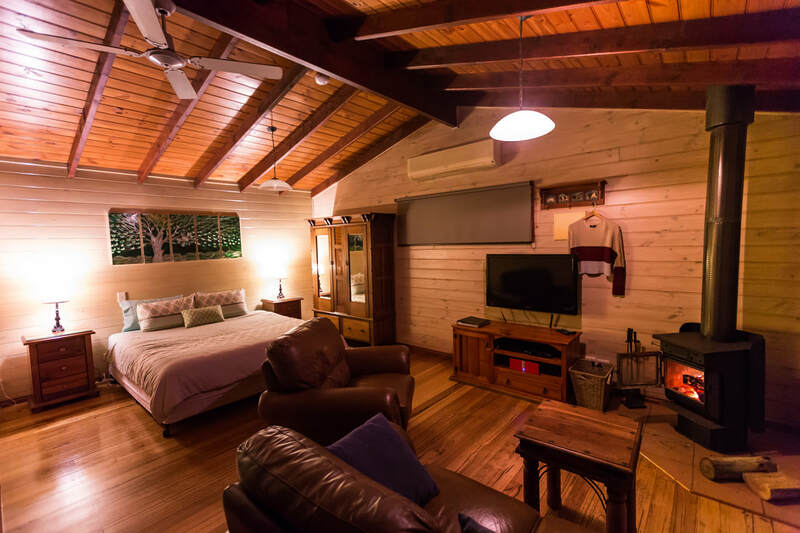 A huge bathroom makes this cottage the perfect stay- with toiletries and bathroom linen all supplied. Bathroom also includes washing machine/drier. It also house that amazing jacuzzi. Our rustic cottage has views that will leave you spellbound. Nature's playground is just outside your door- with kangaroos, kookaburras, currawongs, eagles your neighbour.